"Fools! You don't even know the meaning of misfortune!" A mountain spirit Transient incarnated in the shape of a bear. Due to unforeseen circumstances, he lost his Summoner. He currently belongs to the Arakawa Guild among other Stray Transients who have gathered in self-defense. In order to earn their keep, they do the dirty work commissioned by the Roppongi Guild. He cares deeply for his friends and holds good will toward anyone who would show compassion toward his friends. A mountain spirit, manifested in the form of a bear, who became a stray summon after a tragedy beyond his ability to stop took the life of his summoner. Barghest belongs to the Arakawa guild, an organization made up of many stray summons who have come together for self defense and support. To get by, he sullies his hands with the dirty work the Roppongi Guild doesn't wish to do. Barghest cares deeply for the strays under his protection, and those who respect and help his fellows earn his admiration. Holds a Sacred Artifact of Shackles that attracts those with malice, grudges, and hatred. Those who have garnered much hatred often hire him to use as a shield. He has also been used as bait to capture those antisocial Transients close enough to be attracted. Like the canary in the coal mine, his misfortune will continue as long as he draws breath. 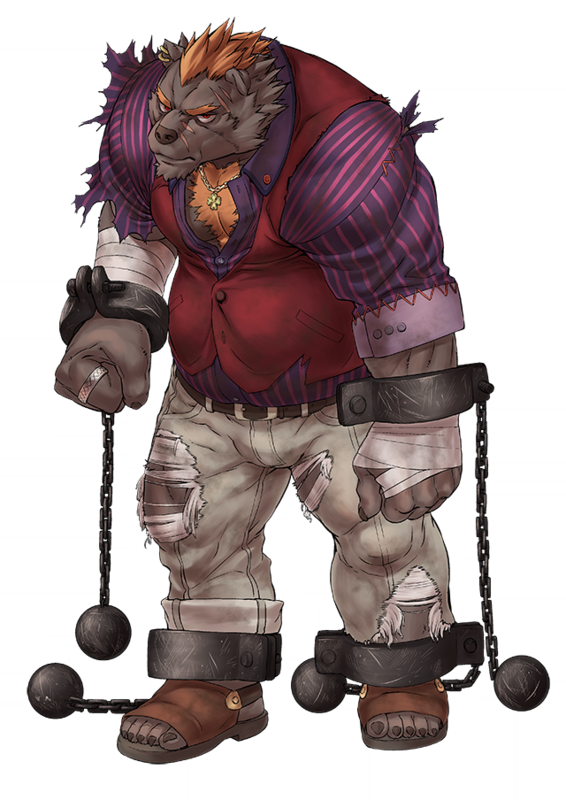 His shackles are a Sacred Artifact, but also a terrible burden that attract hostility, hatred and grudges, and he uses them more to shield blows from the assailants than as a weapon. As he struggled to get by, a desperate Barguest was hired to wear these shackles, to used as a decoy to gather rogue summons who have become a danger to society, where they can all be captured in one fell swoop. Fated to serve as a mine canary, til his dying breath, new wounds will be engraved into his body with each day. In English folklore, Barghest is a sort of mountain fairy appearing in the form of a black dog or bear. The sound of rattling chains follows them, and they are considered an omen of death. I like him and use him in my team but his voice is just too loud for me. who invited him to the bar? This page was last edited on 21 April 2019, at 20:13.